As the senior English teacher and resident BASIS Independent DJ I've got to take over the pen and microphone for a bit. There is some really, really good stuff on Eureka! Brooklyn, but it's come time for me to insinuate my good sense and sensibility, my dear old penchant for description, and my heartfelt artistry of persuasion. Good day students and families! I hope that you've had an amazing summer vacation after our first school year together as BASIS Independent Brooklyn. And, I cannot wait to hear some tales of how your summers went for all of you! This summer was an extra special one for me mostly because it was my first summer off of work as a teacher, yet most importantly and interestingly, not having to teach classes during these last two months allowed me the chance to travel to Europe for the first time in my life! And get this, the real bonus to my summer vacation was that I left New York City for Europe on my birthday! What a great present, right?! So then, I would very much like to share some photos, videos, and brief stories about the neat adventures that myself and Maegan, my traveling sidekick and wife, experienced while visiting the many places we did when abroad. Okay, I should probably begin with the first stop on our European tour this summer: Iceland! Now if you're a NYC Subway straphanger, then you might remember seeing some ads for a "free stopover in Iceland" from Icelandair. Well those ads planted a seed inside my mind long ago, and eventually Maegan and I chose this airline so that we could stay for a few days in Iceland's capital city, Reykjavik, before moving onto London to visit some close friends of ours who have since become expats. The video above is of a river that we passed while cruising along Route 36. The bridge crossing was so small only one car could pass at a time! Also it had rained the day before we landed in Iceland, so this river was particularly swollen from the rainwater that had drained from the mountains off in the distance to the left. As you can see the landscape is lush and green, yet devoid of tall trees. Since Iceland is only 8 million years old, one of the youngest landmasses on planet Earth, and because it is so close to the Arctic Circle allowing a very short growing season, forests have not developed on the island. Instead mosses, grasses, shrubs, and beautiful wildflowers cover the land! The next stop along The Golden Circle was Gullfoss, Iceland's very own Niagara Falls! Many waterfalls grace Iceland's landscape; however, few compare to Gullfoss, or the Golden Falls. It was deemed a national landmark and preserved, partially due to the advocacy and grassroots conservation efforts of a woman named Sigríður Tómasdóttir. On sunny days, the mist rising from the spray of the falling Hvítá river creates an eternal rainbow which hovers over the site, but unfortunately overcast skies prevented us from seeing any rainbows when we visited. Still, the sheer noise and liquid power of the water crashing over 200 feet down was an awesome force to behold. Oh! The coolest thing about visiting Gullfoss is that one can get very very close to the falls. If you look in the video above, you'll notice a rocky outcrop on the left in the middle of the falls. We were able to walk out on to this ledge and view the falls from the closet possible vantage point. Wow, was it something else! 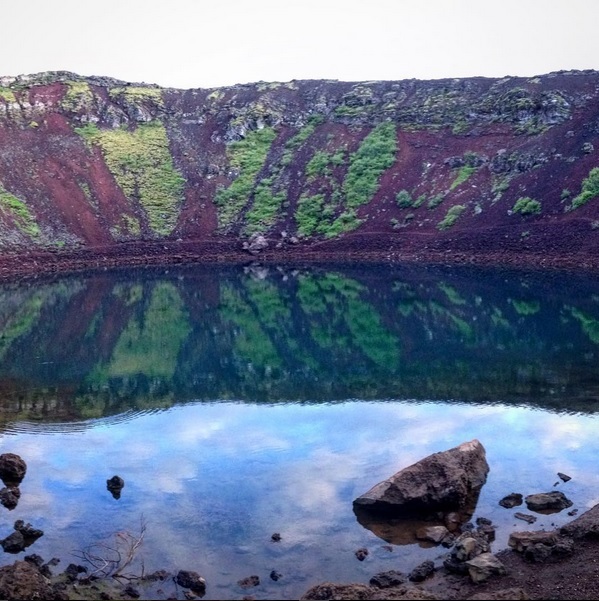 One of the final stops along The Golden Circle was Kerið, a volcanic craterlake approximately 3000 years old! There is a path along the least steeply-walled side of the crater, behind the perspective of the photo above, allowing visitors to hike down 180 feet into the deceased volcano's caldera. As we learned from the signs near the entrance to the site, scientists believe that Kerið was a cone volcano which erupted and emptied its magma reserve as it moved away from the local hotspot below the Earth's crust. With the volcano's magma gone and unable to support the cone, the massive weight of the rock that formed the cone collapsed into the empty magma chamber which was then inundated by the water table. As the photo above shows, Kerið is uniquely beautiful due to its red volcanic rock composition. After completing The Golden Circle and our three day stay in Iceland, we headed to the United Kingdom to visit some close friends named Mary and Brett in London. Both our friends were working the afternoon that our plane landed, so we had to make our own way to their flat (the British name for an apartment) by taking the Underground, or tube (the British name for the subway system). As you might experience yourself when traveling on the NYC Subway, one can get quite hungry when whizzing along the tracks below the city. And we when finally emerged above ground in the London neighborhood of Clapham Commons, we were starving! On the way to our friends' flat, we ate some of the best sandwiches we've ever had from M.Moen and Sons, which is a long-established butcher shop featuring top-class free-range and organic meats, charcuterie, cheeses, and other fine deli foodstuffs of British, Italian, and French origin. Mary works as a butcher here part-time, so we got our sandwiches on the house! Mine, on the left, had mortadella and Swiss cheese topped with salad (the British word for lettuce), tomatoes, and a handmade olive tapenade. Maegan's, on the right, had roast beef and blue cheese topped with salad, tomatoes, and a delicious horseradish mayonnaise. The really awesome thing about this culinary experience is that Maegan, Mary, and I all worked together as chefs during our undergraduate years near Cincinnati, Ohio. So, this became just one more chance for the three of us to show our mutual adoration for darn-good food. 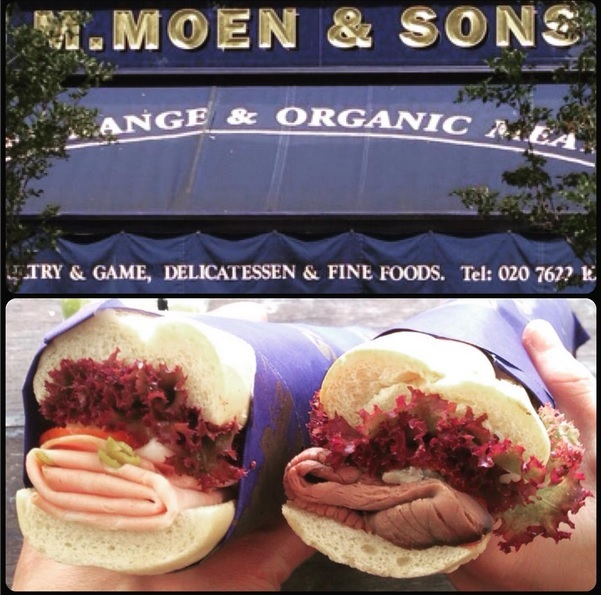 If you are ever in London, I'd definitely recommend you making a lunchtime stop at M.Moen and Sons. Our travel plans then brought us to Spain, but first we had to get there... So we took the EuroStar from London to Paris, where we spent the night. 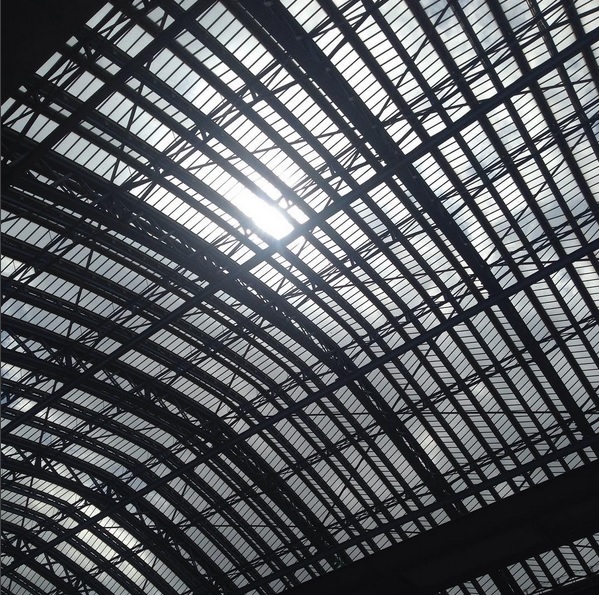 Above is a shot I took when standing on the platform at Gare de Nord when we arrived in the French capital. The next morning we boarded a TVG train in Paris to get to Perpignan, then from Perpignan to finally arrive in Barcelona! I absolutely loved traveling through the European countryside by rail. The speed at which these trains travel is incredible too, up to 300 kilometers an hour or 185 miles per hour! Trains are such an eco-friendly and efficient means of transportation, and my experience made me wish that there was a more efficient train system here in the United States to connect our many cities. All in all, my most favorite thing about the trains was that this form of travel allowed much time for me to catch up on my summer reading! If one considers one's self a gourmet who is worth their salt, then one must delve deeply into the culinary offerings of the Spanish culture. 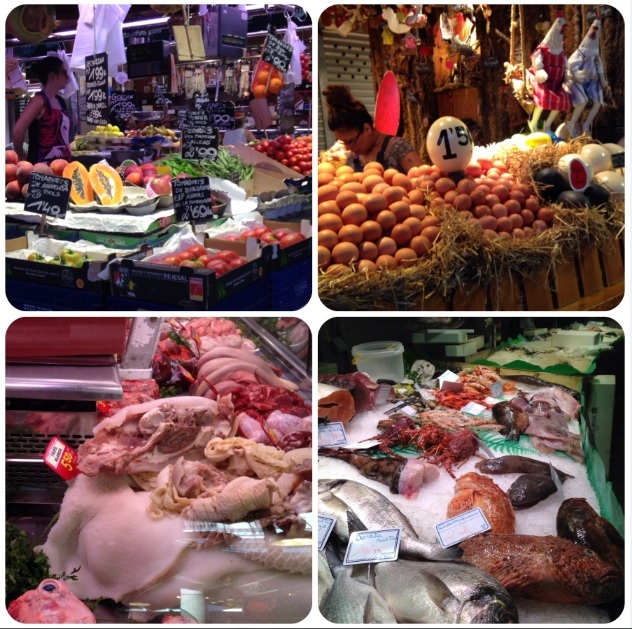 Luckily, when staying in the Barcelonan neighborhood of Poble-Sec, Maegan and I were quite close the city's central market named Mercat de San Josef de la Boqueria, pictured above. Here we could obtain all kinds of locally-sourced fruits and vegetables, meats and seafood, exotic spices and dried provisions, and of course freshly baked breads and pastries. The video above is a time-lapse I shot when surveying the seemingly countless stands and counters of this historic market which dates back to the early 1200s! The best thing about market shopping in Spain is that most items are quite affordably priced when contrasted with our food prices here in New York, especially prices on produce. But you have to do a bit of searching at this particular market due to tourism. Therefore, our travelers' advice for this culinary destination is to avoid the overpriced mini-restaurants within La Boqueria. Rather, buy the raw provisions you wish to eat and make the meal yourself! Obviously this isn't possible if you're staying in a hotel, but try Airbnb and you'll easily find an apartment with a kitchen in Barcelona's city central for around 40-50€ a night. This video is another time-lapse shot of our visit to Mercat Central in Valencia, our second destination in Spanish. While Valencia is the third most populated Spanish city, it seemed to be less frequented by great numbers of tourists, so our experience at this fresh market was much more pleasant than at La Boqueria. Again, you'll notice that there are many stands devoted to vegetables and fruits, the Valencian orange being the prized crop of the Valencian and Catalonian regions. Maegan and I also indulged in Saturn peaches, commonly known as donut peaches here in the States or paraguayos in Spain. Not only were they very cheap, about 1.25€ a kilogram, but they were also huge compared to the variety we've seen in America. Seriously, we've never tasted a more juicy and flavorful peach in our lives. 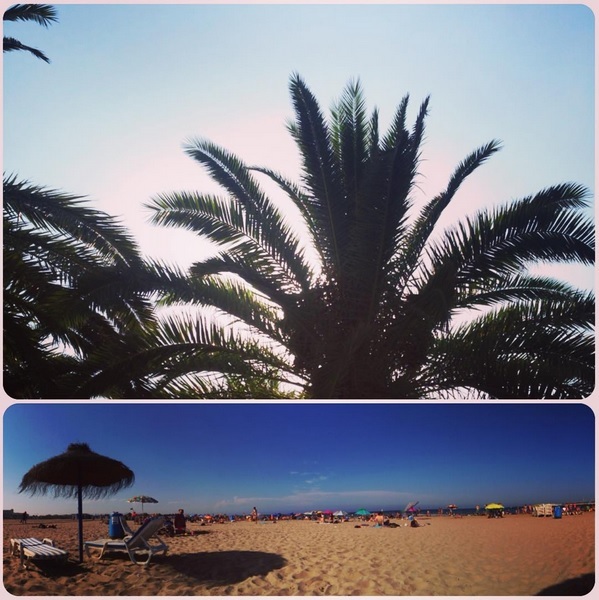 Should you ever find yourself on the Spanish Mediterranean coast, you must give them a try! The last thing I'd like to show you about Mercat Central is the large dome in the center of the building. 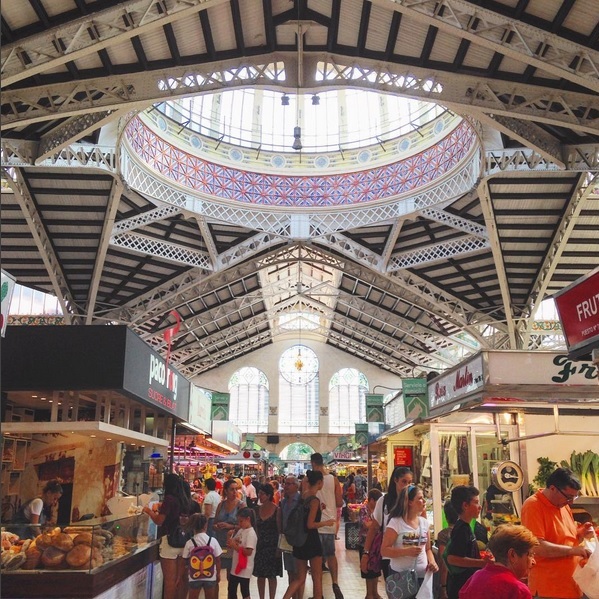 While this market is considered one of the oldest markets in Spain, the beautifully architectured building that stands on the site was constructed in 1914. One gains a sense of the sublime when standing below the dome and listening to the hullabaloo of the market vendors and patrons conducting their daily business. One thing that our visit to Spain taught us is that despite the diversity between the cultures of the world, humans tend to be driven by the same culinary themes. In other words, they share their passion for taste and sensation through the careful and prideful presentation of their nation's food. While in Barcelona and Valencia, my wife and I saw some of the oldest and most beautiful buildings that we have ever encountered! Mostly these were churches and markets, but many others were portions of fortresses or medieval aged city gates and walls. We even walked what were once Roman roads! But nothing could have prepared us for what we saw around the corner from where we were staying in Valencia. 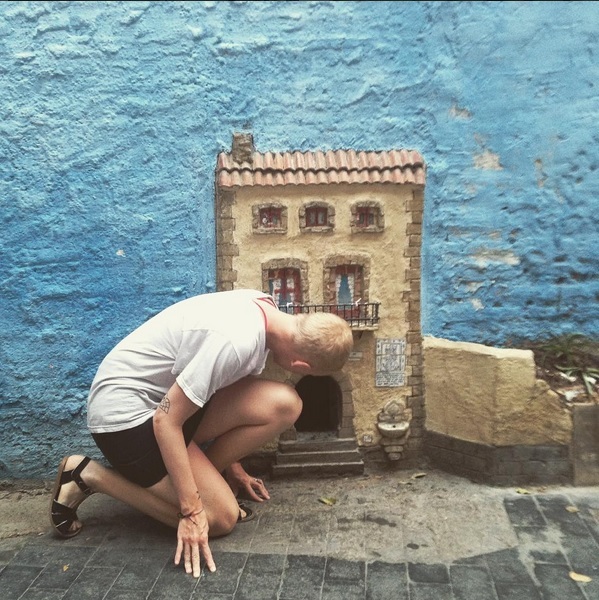 While strolling through the Plaça del Carme, Maegan came upon a real cat house! Into the side of one of the walls surrounding the plaza was a tiny entrance for cats to get through to their home. Since we have two cats in our home in Brooklyn, we fell in love with this site immediately! Indeed stray animals are a problem in most cities around the world, so how smart and cool is it, we thought, for the local people to designate a place for their city's feline residents to live, no? 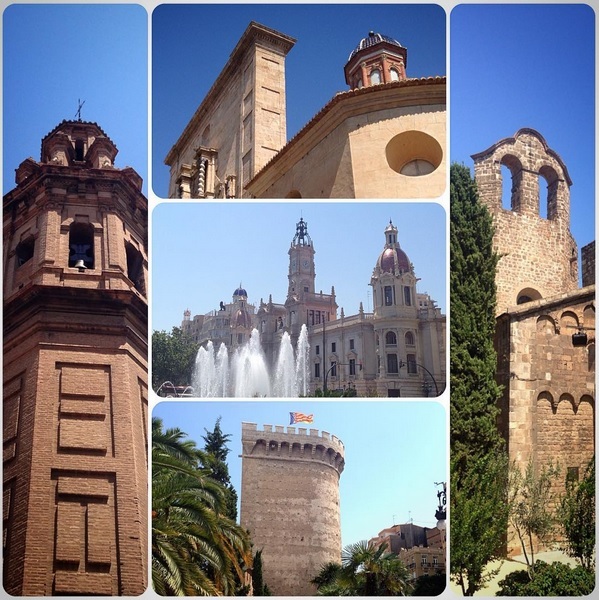 Over the week we finished our stay in Valencia and then made our way even further south to the city of Alicante. Unfortunately, this city was very touristy, yet it was here that we found some quiet time to rest on the beach before finally making our way back to New York City. All in all, being able to finally realize one of my life's dreams by traveling to Europe was simply just a wonderful and enlightening experience. Transversing the Icelandic terrain and exploring some of its most noted geological formations with my wife was a perfect way for us to share our love for the beauty of the natural world. I'll have to bring some of the volcanic rocks we managed to sample to Ms. Santare's science classroom this coming year. With our edgy and punky Brooklyn style, we felt right at home in London and would definitely visit again. And, being the DJ I am, you know I'll have to share some of the music I gathered with Mr. Goldman's Guitar class! And lastly, adventuring through the many markets shown above and immersing ourselves in the culinary landscape of the Spanish culture was something that the chef inside both myself and Maegan will cherish forever. The next BASIS Independent potluck will undoubtedly see some of the food knowledge we picked up while visiting Spain! Sure, there were some other items we brought back as gifts for friends and family, and we even got ourselves a few souvenirs. But the real thing that I've returned home with is a greater understanding of humanity's passion and how it gets expressed through diversity in the world.